Instant downloads of all 946 LitChart PDFs (including Letter from Birmingham Jail). 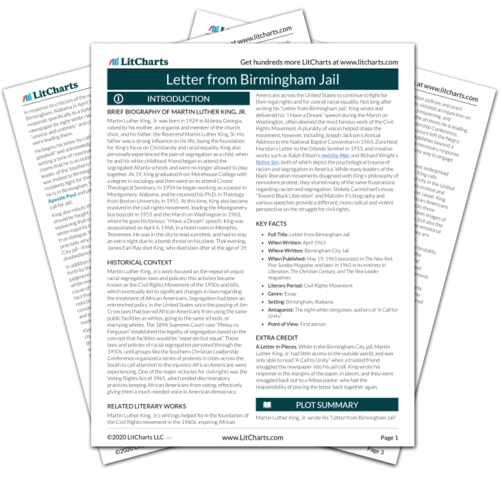 Welcome to the LitCharts study guide on Martin Luther King, Jr.'s Letter from Birmingham Jail. Created by the original team behind SparkNotes, LitCharts are the world's best literature guides. A concise biography of Martin Luther King, Jr. plus historical and literary context for Letter from Birmingham Jail. A quick-reference summary: Letter from Birmingham Jail on a single page. In-depth summary and analysis of every of Letter from Birmingham Jail. Visual theme-tracking, too. Explanations, analysis, and visualizations of Letter from Birmingham Jail's themes. Letter from Birmingham Jail's important quotes, sortable by theme, character, or . 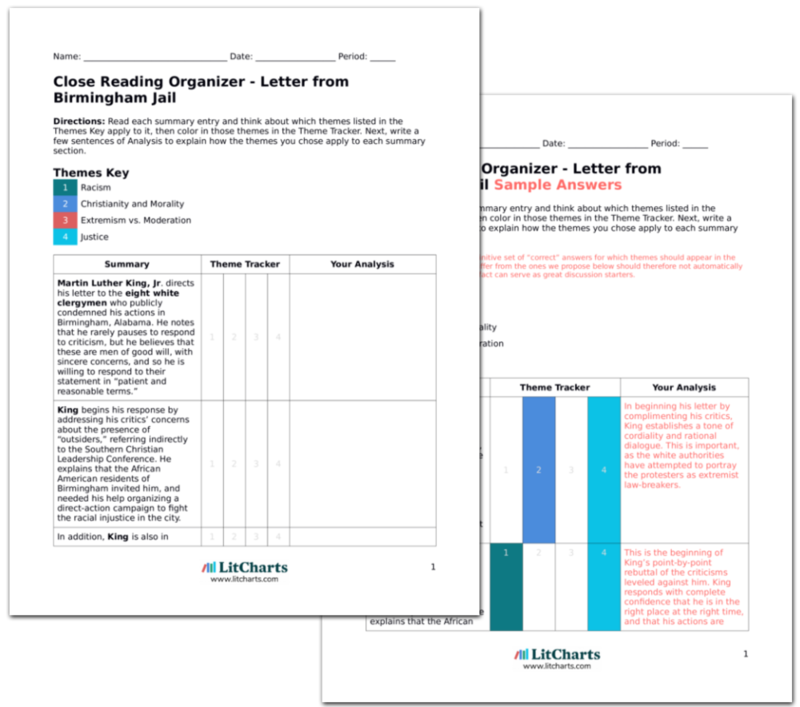 Description, analysis, and timelines for Letter from Birmingham Jail's characters. Description, analysis, and timelines for Letter from Birmingham Jail's terms. Explanations of Letter from Birmingham Jail's symbols, and tracking of where they appear. An interactive data visualization of Letter from Birmingham Jail's plot and themes. Brief Biography of Martin Luther King, Jr.
Martin Luther King, Jr. was born in 1929 in Atlanta, Georgia, raised by his mother, an organist and member of the church choir, and his father, the Reverend Martin Luther King, Sr. His father was a strong influence on his life, laying the foundation for King’s focus on Christianity and racial equality. King also personally experienced the pain of segregation as a child, when he and his white childhood friend began to attend the segregated Atlanta schools and were no longer allowed to play together. At 19, King graduated from Morehouse College with a degree in sociology and then went on to attend Crozer Theological Seminary. In 1954 he began working as a pastor in Montgomery, Alabama, and he received his Ph.D. in Theology from Boston University in 1955. At this time, King also became involved in the civil rights movement, leading the Montgomery bus boycott in 1955 and the March on Washington in 1963, where he gave his famous “I Have a Dream” speech. King was assassinated on April 4, 1968, in a hotel room in Memphis, Tennessee. He was in the city to lead a protest, and had to stay an extra night due to a bomb threat on his plane. That evening, James Earl Ray shot King, who died soon after at the age of 39. 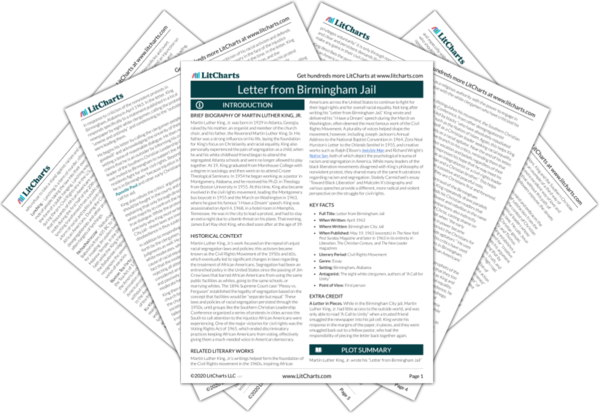 Get the entire Letter from Birmingham Jail LitChart as a printable PDF. Martin Luther King, Jr.’s work focused on the repeal of unjust racial segregation laws and policies; this activism became known as the Civil Rights Movement of the 1950s and 60s, which eventually led to significant changes in laws regarding the treatment of African Americans. Segregation had been an entrenched policy in the United States since the passing of Jim Crow laws that barred African Americans from using the same public facilities as whites, going to the same schools, or marrying whites. The 1896 Supreme Court case “Plessy vs. Ferguson” established the legality of segregation based on the concept that facilities would be “separate but equal.” These laws and policies of racial segregation persisted through the 1950s, until groups like the Southern Christian Leadership Conference organized a series of protests in cities across the South to call attention to the injustice African Americans were experiencing. One of the major victories for civil rights was the Voting Rights Act of 1965, which ended discriminatory practices keeping African Americans from voting, effectively giving them a much-needed voice in American democracy. Martin Luther King, Jr.’s writings helped form the foundation of the Civil Rights movement in the 1960s, inspiring African Americans across the United States to continue to fight for their legal rights and for overall racial equality. Not long after writing his “Letter from Birmingham Jail,” King wrote and delivered his “I Have a Dream” speech during the March on Washington, often deemed the most famous work of the Civil Rights Movement. A plurality of voices helped shape the movement, however, including Joseph Jackson’s Annual Address to the National Baptist Convention in 1964, Zora Neal Hurston’s Letter to the Orlando Sentinel in 1955, and creative works such as Ralph Ellison’s Invisible Man and Richard Wright’s Native Son, both of which depict the psychological trauma of racism and segregation in America. While many leaders of the black liberation movements disagreed with King’s philosophy of nonviolent protest, they shared many of the same frustrations regarding racism and segregation. Stokely Carmichael’s essay “Toward Black Liberation” and Malcolm X’s biography and various speeches provide a different, more radical and violent perspective on the struggle for civil rights. A Letter in Pieces. While in the Birmingham City jail, Martin Luther King, Jr. had little access to the outside world, and was only able to read “A Call to Unity” when a trusted friend smuggled the newspaper into his jail cell. King wrote his response in the margins of the paper, in pieces, and they were smuggled back out to a fellow pastor, who had the responsibility of piecing the letter back together again. Sherriff, Gina. "Letter from Birmingham Jail." LitCharts. LitCharts LLC, 6 Dec 2018. Web. 11 Dec 2018. Sherriff, Gina. "Letter from Birmingham Jail." LitCharts LLC, December 6, 2018. Retrieved December 11, 2018. https://www.litcharts.com/lit/letter-from-birmingham-jail.